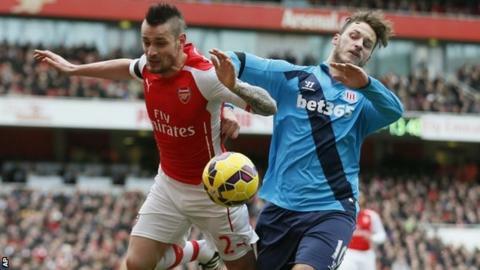 Arsenal defender Mathieu Debuchy dislocated a shoulder during the 3-0 Premier League win against Stoke. The Frenchman, 29, landed heavily after colliding with Stoke's Marko Arnautovic and was replaced by Hector Bellerin in the 13th minute at Emirates Stadium. Arsenal boss Arsene Wenger said: "It's dislocated so it will take a while. He will have to see a specialist." Debuchy, who joined from Newcastle last July, has missed three months of the season with an ankle injury. During that absence Calum Chambers and Bellerin deputised at right-back. Speaking after the game, Wenger confirmed Debuchy would not be fit by next week. An ongoing ankle injury to left-back Kieran Gibbs may influence his activity in the January transfer window. "Nacho Monreal and Debuchy can play centre-back. But if Gibbs is not here, Monreal cannot play centre-back and if Debuchy is not here, he cannot play centre-back. "This is a position where we are short." Chambers was also absent from the win against Stoke through illness.